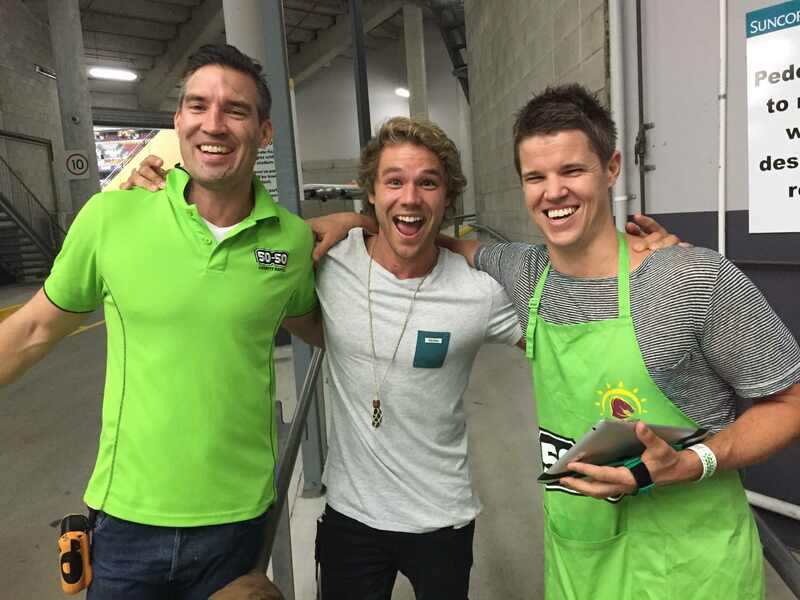 WHAT started as a whim has turned into a charitable labour of love for two mates. Along the way, it involved lobbying the government for regulatory changes that would ultimately rake in thousands for charity and worthy winners. The 50-50 Foundation sells raffle tickets to patrons at sporting events, recording each transaction on a mobile device with all of the proceeds going to a prize pool. Excitement builds as the value of the pot escalates and updated in real-time on the big screen. A winner is randomly selected, taking home 50 per cent of the prize pool with the remaining 50 per cent donated to the sporting club's charity of choice, including Starlight Children's Foundation, Mission Australia and AEIOU. Macquarie Bank senior advisor John Corry came across the concept while watching an ice hockey game with his new bride in Canada. Witnessing the excitement first-hand and potential earnings for charity, he spent the rest of the trip devising a plan to bring it back to Australia. He called in his best mate, the founder of Gold Coast-based finance company Premium Funding, Ross Hayward, to utilise his technology expertise. Having both previously donated money to charitable causes, they decided to combine philanthropy with their love of sport and establish a sustainable initiative to make an even bigger impact. The 50-50 Draw has raised more than $800,000 since 2013, earning the founders the inaugural Social Entrepreneur trophy at this year's Brisbane Young Entrepreneur Awards. Along with their own investment, Corry says it has been three years of blood, sweat and tears. "We spent about $150,000 to get it up and running, but we didn't think it would cost that much," Corry says. "After getting initial approval from a lawyer, we met with the Reds and Broncos to get them on board and had the IT guys build the software with iPads, Bluetooth printers and a server in our own room at Suncorp Stadium. "We were ready to go and about two weeks prior to the first game, we received a letter from State Government saying it was illegal and about 12 reasons why. "I just felt sick. I thought I'd not only blown my own money, but my mate's as well which is horrible." Operating on a Category 3 gaming license, the tickets must state the prize and its value while the prize pool in the 50-50 Draw is different each game and not determined until the end. Before leading social change, Corry and Hayward had to lobby the government to change its regulations around charitable gaming licences. "It took every hour of the day for months with meetings, there were 12 lawyers working on it at one point with all different divisions of government," Corry says. "It was an absolute nightmare at the start, but we eventually got there after the most stressful three months of my life." The 50-50 Draw has now become a sustainable enterprise, reporting growth across all metrics including ticket sales and crowd participation. The Broncos and Reds pay a small fee to manage operational expenses, including iPad repairs, paper ticketing, insurance, volunteer snacks, uniforms and security to handle the money. Up until that point, Corry and Hayward covered the difference. They hope to reinvest the money into the draw and upgrade equipment next year. The pair were also able to hire a friend, who previously worked at Youngcare, and sponsorship firm International Quarterback to manage up to 40 volunteers on game day and count cash. They also receive pro-bono support from an accountant, lawyer, web developer and PR company. "I couldn't even exaggerate the amount of work that's gone into it," Corry says. "Even now, we have to report to the government about the game, estimated crowd numbers, takings and they have to inspect the technology and random draw generator. The reports, as well as our full annual report, are signed off by an auditor. "I was having to go to every single game. It sounds fun, but when you're there twice every weekend from 6am to midnight and you don't get to see any of the game, it takes the fun out of it." 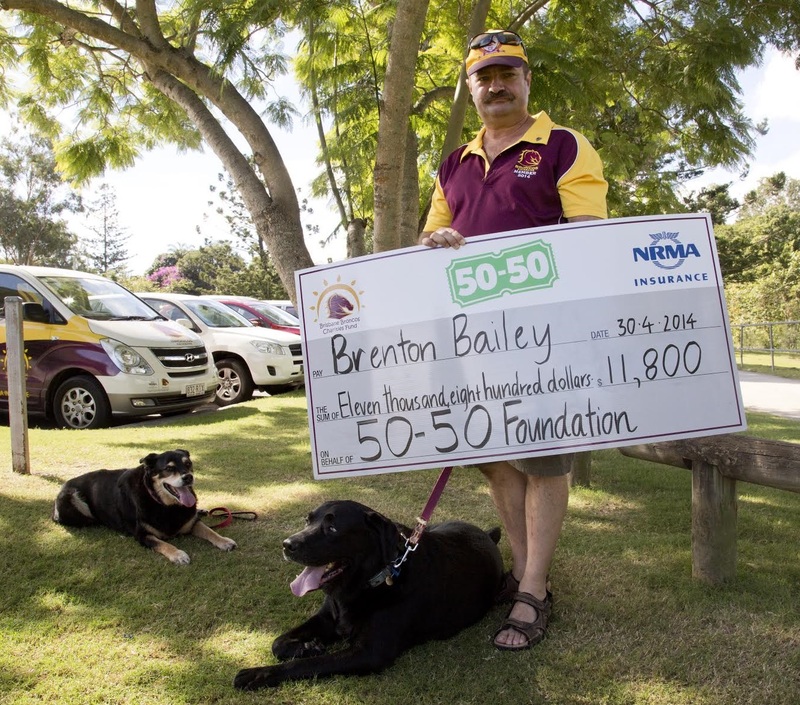 As well as raising funds and invaluable awareness for worthy causes, the other 50 per cent of the prize pool has made a difference in people's lives. Corry says there are some amazing stories behind the winners, from being able to take their families on dream holidays to patients paying off hospital bills. 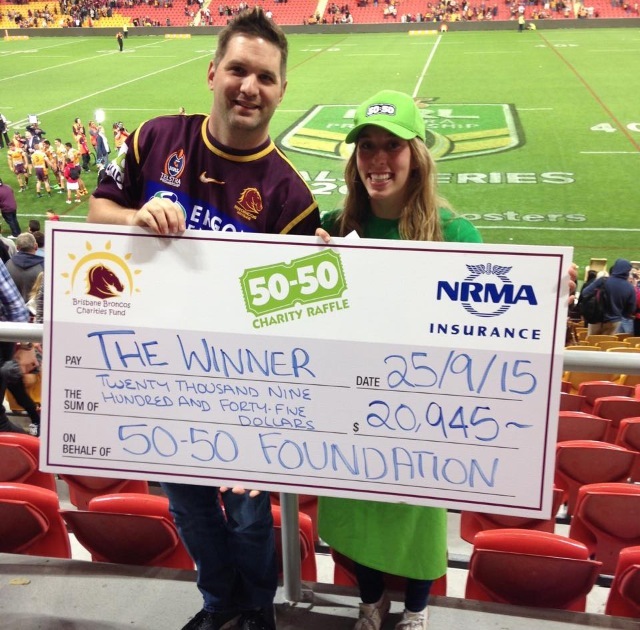 "Last year, a full Broncos fan and ex-army officer won the record total at the time of $23,000 on Anzac Day," he says. "We presented him with the novelty cheque afterwards and he told us his best mate was dying of cancer and he was going to use it to pay for the operation. We asked who his friend was and he said it was his dog named Lockyer. "We get some really nice comments and emails from charities and beneficiaries and it makes it all worthwhile." Corry and Hayward have attracted interest from corporate partners, as well as fielded requests to recreate the 50-50 Draw at major AFL clubs, other sporting events, concerts and even in New Zealand.